To provide special needs individuals and their families a day on a boat, a day of entertainment, music, games, food and drinks. This day is provided to these individuals and their families at no cost to them. Boat Kids is a nonprofit 501C3 organization and annual event established in 2012 to include but not limited to any autistic, spina bifida, cerebral palsy, special needs, mentally and physically challenged individuals and their family in the Tampa Bay/St.Petersburg area. 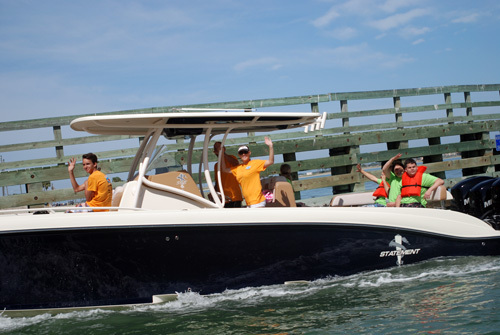 Boat Kids is made up of volunteers from all over that have a common love for boating and are elated to be able to extend their time and boats to allow a special needs individual and his/her family to create many extraordinary memories that they may not normally get the opportunity to do. not know that they have a love for the water and power boating. To be able to see the excitement, not only on the individual’s faces, but the family’s faces that are being able to witness the thrill of their loved ones experiencing a new adventure. It is truly a life changing event for everyone involved! Our 6th Annual Boat Kids Event was a HUGE Success with lots of returning and many new Participant Families, Volunteers, Boat Hosts and Sponsors!